Preheat oven to 350º F. Line baking sheets with parchment paper or silicone mats. In a medium bowl, combine flour, pudding mix, and salt. Set aside. using an electric mixer on medium speed, cream butter and ½ cup sugar until light and fluffy, scraping the bowl continually, about 1-2 minutes. Reduce speed to low. Add vanilla extract, lemon zest, and optional food coloring. Gradually stir flour mixture into creamed mixture a bit at a time until well blended, scraping the bowl constantly. Scoop cookie dough into teaspoon-sized balls and roll them in between the palms of your hands until smooth. Place the balls in 2 inches apart. Press each ball slightly so that it is shaped like a disc. Bake cookies for 9-11 minutes. Do not overbake. Pour remaining ½ cup powdered sugar into a medium bowl or onto a dinner plate. Remove baking sheets from the oven. Allow cookies to sit for a minute or two on the baking sheet to firm slightly. Use a slotted spatula to lift cookies from the baking sheet and set them in the powdered sugar. Turn the cookies so they are completely coated with powdered sugar. Transfer cookies to a cooling rack. Allow them to cool completely. Store in an airtight container with waxed paper between layers. If cookie dough is soft – whether from a warm kitchen or because butter has been allowed to thoroughly soften before mixing – you can divide it in two, wrap each ball in plastic wrap, and set it in the refrigerator to firm for an hour before forming cookies. Use a slotted spoon or slotted spatula to lift the cookies from the powdered sugar, allowing the excess sugar to sift through the slots. 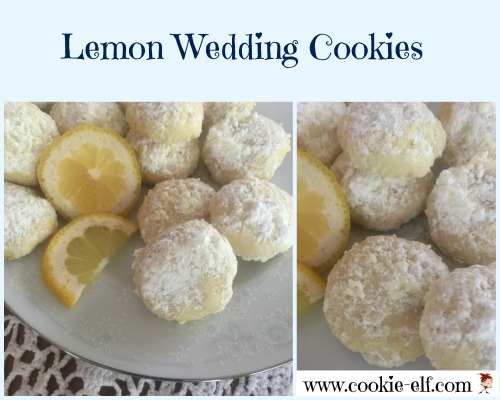 See more inspiration on our Lemon Cookies Pinterest board. Mexican Wedding Cookies recipe: not just for weddings!